Description: A picture frozen in time. Seeing 104 & 522 in their respective schemes is nice. New Haven Tower would be razed a year later. 104 would be one of the last Phase IV units. Description: Amtrak MOW engines awaiting their next assignment. Description: Amtrak MOW engines awaitig their next assignment. 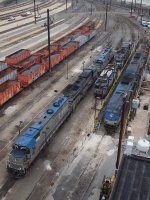 Description: Amtrak locomotives in the yard at 30th Street station. Description: A couple Amtrak electric units are being ferried northbound toward 30th Street Station. Description: An assortment of Amtrak power rests in the services tracks at 30th Street Station. Description: Amtrak 578 pulls Acela power cars 2001 and 2003 sans cars through Wilmington Station on number 1 track. 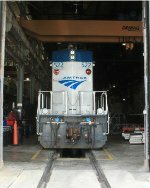 Description: Amtrak 522, long hood view at the shop door. Description: Northbound Amtrak lite locomotives 576 and 522 come up on a stop and proceed signal off number 2 track at Wilmington, DE. Description: Northbound lite Amtrak locomotives 576 and 522 on number 2 track at Wilmington station. Description: Bad spot to put my video camera. Q418 running north at dusk with a Amtrak unit.